Hi everyone and welcome. Here in the UK it's the time of year for Harvest Festivals where we give thanks for the gathering of a good harvest in preparation for the colder months to come. With the arrival of Tim Holtz new Skeleton Leaves Thinlits Dies and the Autumn Sidekick Side-Order dies to my craft room I was keen to create a piece of home decor to celebrate the season. 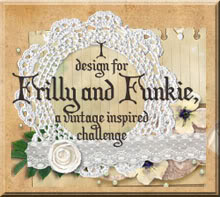 This little panel is the base of one of Tim Holtz Mini Framed Panel and measures 6 1/2 inches by 4 1/2 inches. I've put together a tutorial so you can create one too. Start by covering the Panel in a coat of Tarnished Brass Distress Paint then brush over Ground Espresso Distress Paint in vertical swipes to mimic a woodgrain effect. Brush over an uneven coat of White Gesso, allowing it to part dry before using a slightly damp piece of tissue to remove some of it. 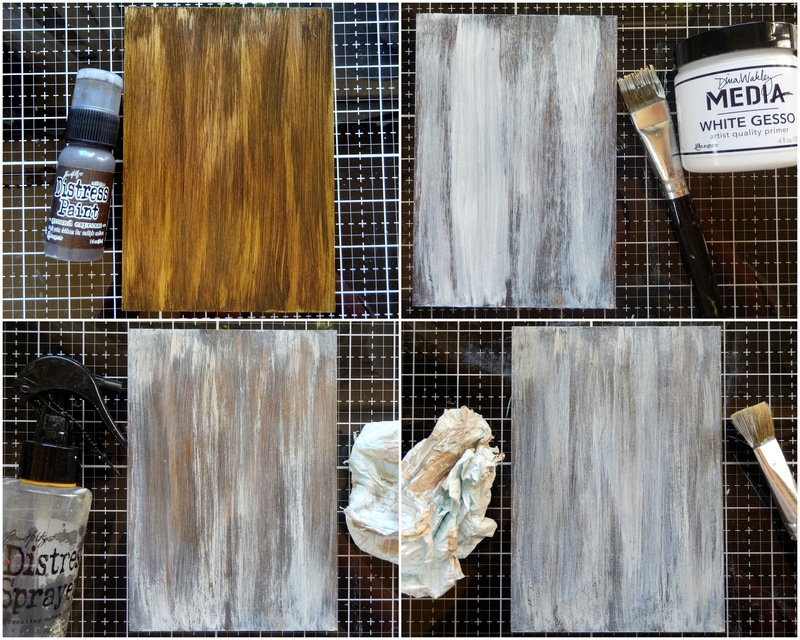 Repeat this process without the water and using less Gesso until you get the weathered look you want. I recommend repeating this process on the reverse of the Panel too. That way you get to choose the side you prefer for the front and if needed you can always paint over the one you are not as keen on. Stamp over the Panel using the script from the Entemology stamp set with Watering Can Archival Ink. Using numbers from the Merchant stamp set and Jet Black Archival Ink stamp add some stamping to each of the four sides of the Panel. Cover one of the Vignette Accents with Picket Fence Distress Paint, allowing it to dry a little before wiping away the excess to reveal the raised silver areas. I didn't show it here but you can dull the colour down by blending a little Brushed Corduroy Distress Ink into the painted areas. 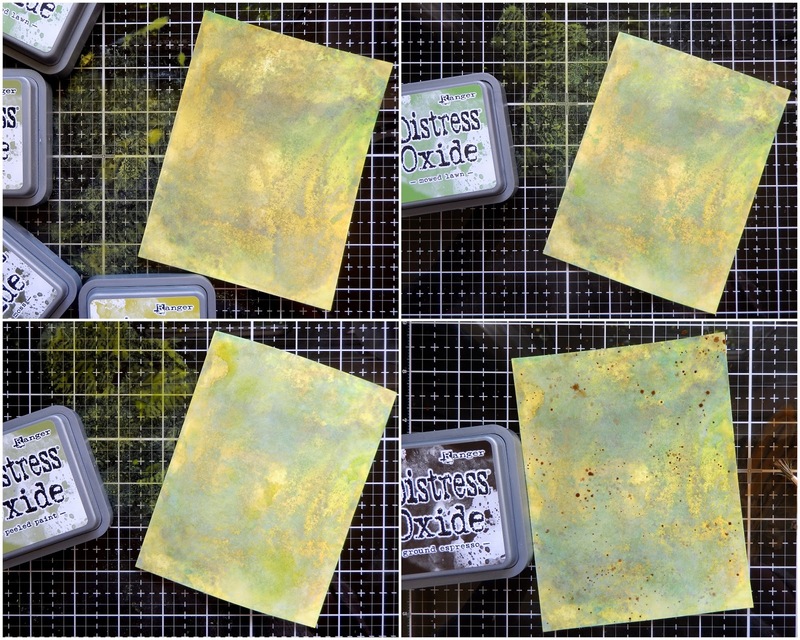 Glue the Vignette Accent to the top of the Panel using Matte Distress Collage Medium as it will dry clear, firm and matte and will shrink back if any oozes out a little. 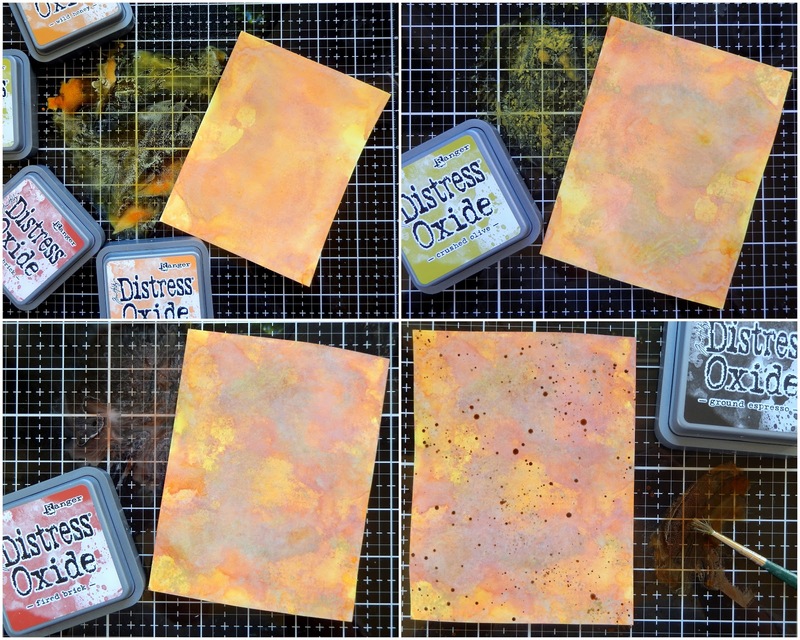 Dip a 4 1/4 by 5 1/2 inch piece of Mixed Media Heavystock into a diluted blend of Spiced Marmalade, Crushed Olive, Fired Brick and Wild Honey Distress Oxide Inks on your Media Mat. I used the glass surface rather than the white mat area so that the ink would pool and mix together. Dry before applying an extra layer of Crushed Olive then another layer of Fired Brick ink. Finally mix Ground Espresso Distress Oxide with water and splatter over the coloured Heavystock. Repeat the previous process on another piece of Mixed Media Heavystock using Peeled Paint, Mowed Lawn, Forest Moss and Crushed Olive Distress Oxide Inks. Use first Mowed Lawn then Peeled Paint inks for your extra layers before splattering again with the Ground Espresso Distress Oxide Ink. Using the Skeleton Leaves Thinlits Die Set and the Autumn Sidekick Side-Order pumpkin die I cut four leaves from the orange Heavystock first before cutting one full and two partial main pumpkin shapes from the leftovers. If you are struggling to make the dies all fit on the one piece of card be aware that you will be cutting off the bottom ends of the leaves so those bits are not essential. From the green inked Heavystock I cut four more Skeleton Leaves and the stalks of the pumpkins. Not shown, I also covered a little piece of Heavystock in Ground Espresso Distress Oxide Ink and cut the pumpkin ridges from that. Using a combination of Collector Layers, sanded Classic Kraft Stock and other coordinating scraps (in this case some of the embossed faux rusted metallic card created on a recent video HERE) add some overlapping layers to the Panel. I used dimensional tape behind the bottom layer to give it more height and Brushed Corduroy Distress Ink on the edges to add some age to them. Now it's time to add the Skeleton Leaves, shaping them by bending backwards down the spines before removing the bottom of the stems and gluing them in place with Matte Distress Collage Medium. Anchor the leaves from roughly two-thirds of the way down the layered stack and work in alternate colours as you build the arrangement. Glue the pumpkins together in a line, hiding the missing parts and add dimensional tape to the back before sticking over the layered leaves. Cut the thanks word from the Autumn Sidekick Side-Order set from silver Metallic Kraft Stock several times and glue together to give them strength before sticking in place over the row of pumpkins. Finally cut a piece of ribbon to the required length, colour with dilute Spiced Marmalade Distress Oxide Ink, and glue in place at the top on the reverse side of the Panel as shown below. 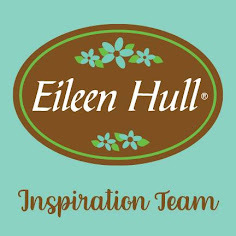 I hope you've enjoyed seeing today's project and feel inspired to give it a go yourselves. 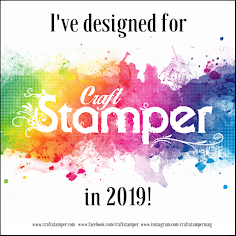 I'm off to Kent this weekend to teach a workshop at The Artistic Stamper so time I disappeared and finished up the prep! For now take care of yourselves and get creative. This is beautiful! !Thank you for the tutorial! Wonderful Jenny! I LOVE your leaves, and the whole process to create the back board...love! SO beautiful! I just love these leaves! They look perfect against the distressed and neutral background.